Depop, who knew? I'd only really considered using the app Depop in the past to buy vintage clothes, but stumbling further into this technological adventure I've found old school cameras, art prints, and, you guessed it, vinyls. This little selection you see here cost me a grand total of £6.50, including postage, and they're all in great condition. A lot of sellers will offer you bundles and postage discounts if you buy more than one item, so it's worth browsing their wares to see if there's anything that catches your eye. 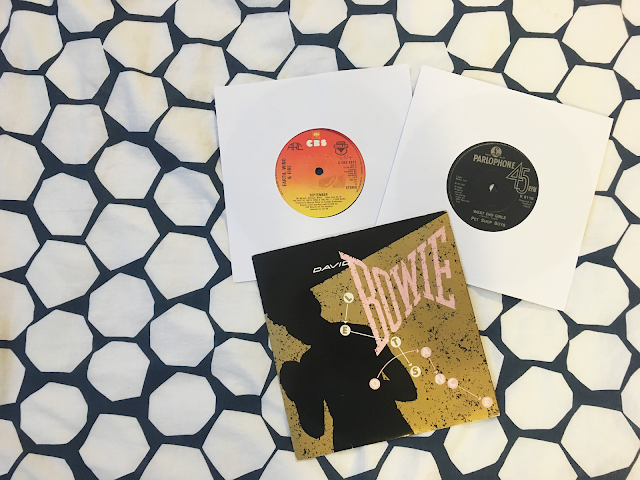 I got 'Let's Dance' by David Bowie, 'West End Girls' by Pet Shop Boys, and 'September' by Earth Wind and Fire from the lovely seller @sogoodvinyl, who I would heartily recommend. He puts new things up every day at fantastic prices, so it's really worth a peruse.